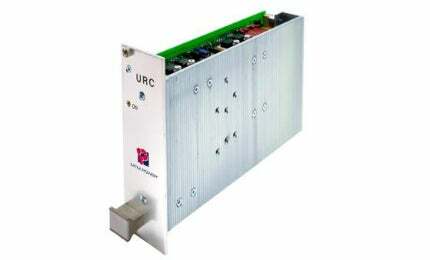 The series URC have been designed as power supplies for the use in vehicles, particularly for railway applications and are available with 50W. Due to the ultra-wide input range of 14.4VDC to 154.0VDC, the converters can be operated at all usual battery voltages (24VDC / 36VDC / 48VDC / 60VDC / 72VDC / 110VDC) acc. to EN 50 155 in railway vehicles and in stationary applications. They are available with single (5.1VDC, 12VDC, 15VDC, 24VDC), dual (±12VDC, ±15VDC) and triple (5/±12VDC, 5/±15VDC) outputs. The converters can be used as a 19" plug-in or for wall mounting both to be connected via a H15 connector and can be switched on and off by the enable input. Further features of the URC series are input and output voltage monitoring, high temperature range, high reliability and long life.